Facing shortfalls, many people are postponing retirement, moving to cheaper housing, buying less-expensive food, cutting back on travel, taking bigger risks with their investments and making other sacrifices they never imagined. He has clients contemplating part-time work into their 70s, he says. Tax-deferred 401(k) retirement accounts came into wide use in the 1980s, making baby boomers trying to retire now among the first to rely heavily on them. The problems are widespread, especially among middle-income earners. About 60% of households nearing retirement age have 401(k)-type accounts, according to government data, and those represent the majority of most people’s savings. The situation is less dire for those in a higher income bracket, who tend to save more outside their 401(k) accounts and who have more margin for error if their retirement returns fall below the recommended 85% figure. Steven Rutschmann, 60 years old, manages the buildings and grounds at a Midwest research facility. His employer recently offered him a bonus if he retired early. Mr. Rutschmann’s 401(k) is well into six figures. His wife has a 401(k) and expects a small pension from her nursing job. An outdoorsman, he dreams of spending time hunting, fishing and hiking. So he consulted a financial planner at Ernst & Young and learned that even with the bonus, his savings could run out before he turns 85. Now he expects to work for several more years. “I was disappointed,” says Mr. Rutschmann, whose 401(k) balance was damaged by the financial crisis and who still has a large mortgage. Some started saving too late or suspended contributions when they or their spouses lost jobs. Others borrowed against 401(k) accounts for medical emergencies or ran up debts too close to their planned retirement dates. In the stock-market collapses of 2000-2002 and 2007-2009, many people were over-invested in stocks. Some bailed out after the market collapse, suffering on the way down and then missing the rebound. But a 401(k) also requires steady, significant savings. And unlike corporate pension plans, which are guaranteed by the U.S. government, 401(k) plans have no such backstop. The government and employers aren’t going to pay more for people’s retirements. Unless people begin saving earlier and contributing more to their 401(k) plans, advisers say, they are destined to hit retirement age with too little money. Vanguard Group, one of the biggest providers of 401 (k) plans, has changed its advice on how much people should save. Vanguard long advised people to put 9% to 12% of their salaries—including the employer contribution—in their 401(k) plans. The current median amount that people contribute is 9%, counting the employer contribution, Vanguard says. Plans of younger people have been affected too. Of those 45 to 59 who had substantial retirement assets prior to the downturn, 40% planned to work longer, according to a study by the Center for Retirement Research. Gloria Moss has been contributing to a 401(k) since 1985, when she went back to work after having children. Especially after divorcing, she wasn’t able to contribute as much as she wished and when her children finished college, she focused on repaying college loans. She says she lost more than half her savings in the recent financial crisis, then shifted heavily to bonds and missed the stock rebound. In her early 60s, she is ready to retire, but if she does that now, “I will have $25,000 to $30,000 a year less than I anticipated having,” she says. To retire at her current standard of living, she figures, she needs nearly twice the savings she has now. Dr. Moss, who has a Ph.D. in education, also made good decisions along the way. She saw trouble coming at the educational software company where she worked and found a new job a week after losing hers. Now she has sold the condominium she loved, near the Atlantic Ocean, and moved to a cheaper house. She cut back on vacations and meals out. She adores the theater but hasn’t been to a play in at least a year. She works extra hours each week and contributes to her employer’s version of a 401(k), but doesn’t feel financially able to contribute the maximum amount. It isn’t possible to calculate precisely how many people are able to cover the recommended 85% of their pre-retirement income, but Federal Reserve data suggest that many people can’t. Such households had a median income of $87,700 in 2009, according to data from the Center for Retirement Research at Boston College, which derived this and other numbers by updating Fed survey data, at The Journal’s request. 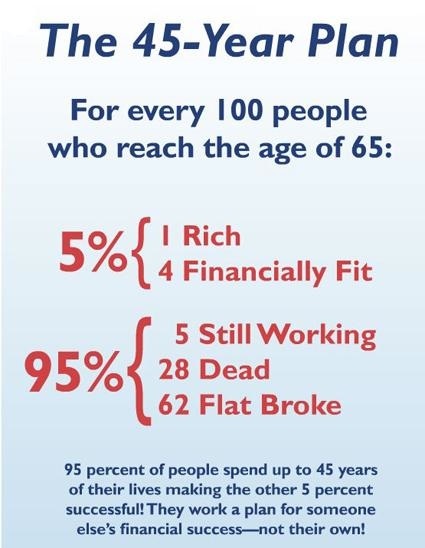 The 85% needed for retirement would be $74,545 a year. Some families do have other income. Just under half expect pension income of a median $26,500 a year. Added to the $9,073 in 401(k) income, that still falls short. Some families have other savings, but Federal Reserve and other data suggest that those don’t fill the gap for most people. These data don’t even include people who are in the direst situations: Those who have lost their jobs, stopped contributing to 401(k) plans or shifted to jobs without 401(k) plans. The numbers also don’t account for inflation, which would further eat into income from a 401(k). Some researchers question the Fed numbers because they are based on surveys rather than on records of actual contributions. Jack VanDerhei, head of research at the Employee Benefit Research Institute, a group supported by 401(k) providers, estimates the median person actually has about $158,754, based on data from 401(k) providers. That is based on individuals in their 60s who have been at the same company for more than 30 years, a somewhat different group than that measured by the Fed data. Even that amount of 401(k) savings generates much less than what is needed. The difficulties have been worsened by the 2007-2009 financial crisis. Since the housing and financial markets began to collapse, about 39% of all Americans have been foreclosed upon, unemployed, underwater on a mortgage or behind more than two months on a mortgage, says Michael Hurd, director of the Rand Corporation’s Center for the Study of Aging. In 2008, when he was 59, John Mastej figured he was on track to retire in his early 60s. He and his wife both were working, with 401(k) plans. Counting all their savings, they had close to $200,000. Mr. Mastej was putting 20% of his salary into his 401(k). The financial collapse cut their savings in half and left Mr. Mastej out of work for two years, with no 401(k) contributions. He had to dip into other savings and use up an inheritance to pay the mortgage. He found a new job in a specialty food store, but it paid much less than his old one in a plastics factory. Today, Mr. Mastej figures he has about $90,000 in savings left, including about $50,000 from the two 401(k)s, now mostly in a fixed annuity that isn’t affected by the stock market. He and his wife have canceled their satellite television and drive 11-year-old cars to work. They buy some food at discounted prices through their church, but are proud they have remained current on their mortgage, home-equity loan, insurance and property taxes. Carol Dailey is continuing to work at age 71. Ms. Dailey spent 10 years as an executive assistant at America Online and had stock options she figures were once worth $1.7 million. The options’ value collapsed with the company’s stock. Now she relies on her 401(k), which took a hit in the 2008 market plunge. She has cut back spending for entertainment and organic food, and continues to work three days a week as an office manager for an Internet security company. “At AOL, we were buying $60 bottles of wine and not blinking. Now I drink box wine,” she says. Some people were done in by the twin collapses of the housing and stock markets. Patti and Bob Webster had accumulated a six-figure balance in their 401(k) accounts and were building a dream house in North Carolina in 2007. They planned to retire there in about a year. Then their builder went out of business and the stock collapse knocked 40% off their savings. They temporarily suspended 401(k) contributions. Today in their mid-60s, they have completed the house but have worked two years longer than planned and expect to work two years more. “We are having to spend another two years in just trying to catch up with what the market did to us,” Ms. Webster says. This entry was posted in CAPITALISM, DEMOCRACY, ECONOMY, EMPLOYMENT, GOVERNMENT, POLICY, RESOURCES. Bookmark the permalink.